Natural fillers were utilized for manufacturing horticultural packaging products. Five types of pots produced from waste paper with wheat and rye bran additions were compared with commercially available containers. The aim was to examine the influence of soil type on the degradation rate and kinetics. Pots were degraded in three soil types: agriculture, forest and sandy soils and were monitored after 2, 4 and 8 weeks. NIR spectroscopy was used for non-destructive evaluation of the chemical composition of the investigated papers in addition to typically used standard methods. All tested configurations of papers might be used for manufacturing of plantable bio-containers that will slowly disintegrate during their use. The addition of cereal bran improves mechanical properties of the paper and extends the lifespan of pots. The rate and extent of decomposition depends mainly on the degradation time and type of soil. Paper pots in all tested configurations degraded most quickly in agricultural and forest soils, each stimulating growth of microorganisms responsible for the decomposition of paper. The obtained results allow selection of products with optimal composition for specific applications and to design the packaging containers degradation time in various in-field scenarios. The manufacturing approach proposed increases the positive footprint of packaging products by designing “eco-effective” solutions according to the Cradle to Cradle design framework. Over 67 million tons of packaging wastes are generated annually in the EU, containing up to 30% of slowly degrading plastics. The Packaging and Packaging Waste Directive, which standardizes the production of packaging materials, waste management and the use of recycling, composting, and energy recovery by incineration regulates the bio-based packing sector (European Parliament and Council Directive 1994). There are clear targets regarding waste reduction in the EU. Seventy-five percent of packaging waste should be recycled by 2030 (Niero and Hauschild 2017). 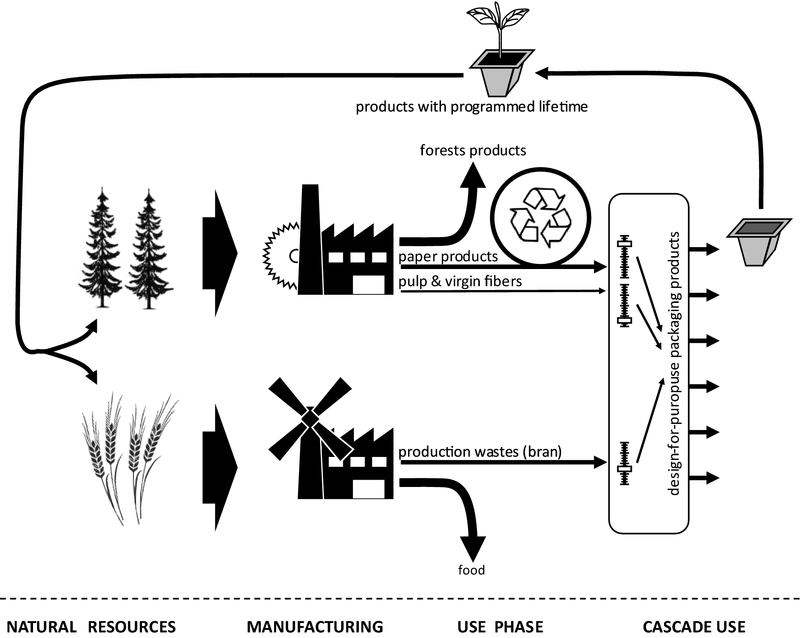 Re-utilization of waste paper is therefore important for reducing waste generation but also for saving wood resources (Kose et al. 2016). According to Chartered Institution of Waste Management, the reduction of waste quantity might save 72 billion € per year and create over 400,000 new jobs in Europe (Cheshire 2016). The increased use of bio-based materials is essential in order to reduce the environmental impact of materials, including reuse and ultimately, disposal. It is expected that use of biodegradable materials will contribute to sustainability and reduction in the environmental impact associated with disposal costs (Song et al. 2009). Moreover, increased bio-based material use is in line with Circular Economy (CE) objectives, which aims to maximize value at each point in a product’s life by keeping products, components and materials at their highest utility at all times (Stahel 2016). Currently, landfilling is the dominant method of packaging waste disposal, followed by recycling, incineration, and composting (Valdés et al. 2014). However, it is considered as “leakage” from circular system, meaning that valuable resources are wasted and lost from environmental and economical point of view (Cheshire 2016). The most favorable way for transformation of ligno-cellulosic wastes is by recycling. The feasibility of recycled fibers for the production of high value-added papers to be used for packaging purposes was recently reported by Tarrés et al. (2018). However, fibres recovered from paper wastes after re-pulping process have reduced mechanical properties. According to Wistara and Young (1999) tensile strength, bursting strength, and apparent density of the pulps decreases when recycling paper. After a maximum of 6–7 recycling cycles, fibres become too short for further processing. Consequently, additives (new fibres or fillers) are necessary to enrich recycled pulp and to minimize depreciation of its quality (Villanueva and Wenzel 2007). In some circumstances increased use of fillers leads to decrease paper strength (Balea et al. 2018). Moreover, physical recycling may be impractical in case of packaging materials contaminated with foods or other biological substances (Kale et al. 2007). Composting paper waste is considered as one of the less costly disposal routes, and is an option for recycling (López Alvarez et al. 2009). In this scenario, biodegradability becomes a desirable feature for several everyday products, including packaging. Although ultimate biodegradability in the natural environment is important, sustainable packaging products are required to biodegrade in a controlled and industrially acceptable way (Scott and Wiles 2001). However, the main factor that affects the formation and manufacturing of bio-based packaging is related to economic aspects. Biodegradable pots, developed as an alternative for traditional petroleum derived plastic containers are environmentally friendly and frequently used for silvicultural and agricultural purposes. Such containers reduce overall costs, as seedlings with the bio-degradable pots can be planted quickly while avoiding root disturbance or any interruption to plant growth. The most commonly used disposable pots are made of peat or a mixture of peat with wood fibres. Such pots can be easily embedded into the soil with plants or converted into bio-gas (digested) after removing the plant. On the other hand, such containers are mechanically unstable and possess high permeability to water vapour. Salt deposition on pot walls is frequently observed and causing nutrient content to become unavailable. This may have a negative impact on plant production and therefore horticulturalists are not always confident to use pots made of peat (Treinyte et al. 2014). Moreover, some consumers avoid the use of peat because peat harvesting may be unsustainable and possibly contribute to global climate change (Mitsch et al. 2013). Containers produced from coconut fibres or bird feathers are interesting alternatives, as these are mechanically more resistant and retain moisture well. However, these cannot be embedded in soil with plants and can only be disposed or digested afterward (Treinyte et al. 2014). Recycled plastic geotextiles are other option recently introduced to the market. These are not easily biodegradable or compostable, but will slowly disintegrate when exposed to the soil. A common limitation of these products is their relatively high price, therefore continuous research regarding development of novel packaging products is ongoing. Natural fibres and agricultural residues are becoming attractive fibre reinforcement solutions for bio-composites (Ochi 2011; Schettini et al. 2013; Nambuthiri et al. 2015; Tesfaye et al. 2017). Substances from plant waste materials (such as: cellulose, hemicellulose, starch, dextrin, and other carbohydrate polymers) are the most convenient solution as they solve two problems simultaneously: they contribute to efficient waste management and avoid or minimize the use of chemical additives as binders (Müller et al. 2007). A solution that fulfils both of these requirements is cereal bran. In typical flour production processes, cereal bran is devoid of nutrients, and is most often separated for disposal, leading to handling, storage and disposal costs. According to Formela et al. (2016) bran are interesting alternative for commercially available cellulosic fillers and could be successfully applied as a low-cost filler in polymer composites. Therefore, bran may be an ideal filler for the extruded paper or pulp containers used extensively in horticulture. It may also serve as an inhibitor controlling the bio-degradation rate in various products (Sandak et al. 2011). Evaluation of paper products decomposition in laboratory conditions with selected microorganisms was previously reported (Modzelewska et al. 2010; Jaszczur and Modzelewska 2011; Sandak et al. 2015). However, López Alvarez et al. (2009) have emphasized the necessity to establish biodegradation curves for different packaging products in landfill and/or composting end-of-life scenarios. Such experiments conducted in different soil types and climates are essential before adopting containers made with alternative materials. It is important to note that the same physical characteristics that promote degradation during composting could also contribute to premature degradation during production and transportation. 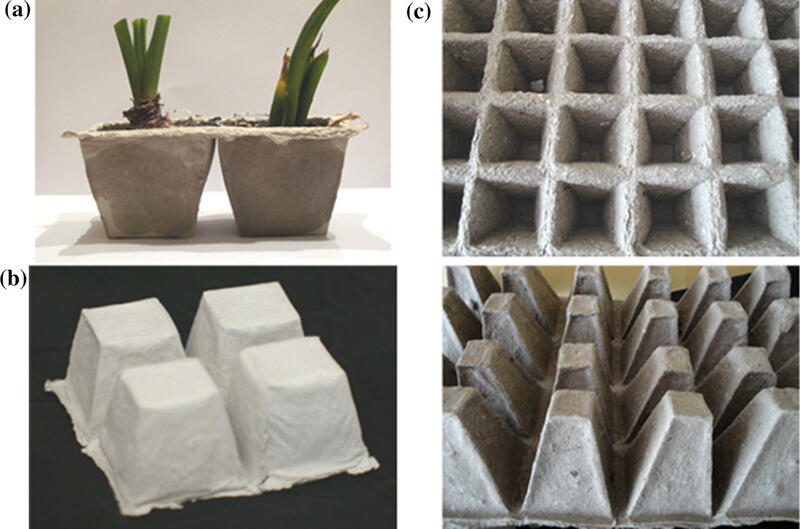 Depending on their capacity to degrade at their end-of-life, alternative containers are usually classified as plantable, compostable or recyclable (Nambuthiri et al. 2015). Various types of soil have different influence on degradation rates mainly due to variability in water-holding capacity (Rahman and Chattopadhyay 2007), available nitrogen, pH, presence of microorganisms and organic matter content (Nambuthiri et al. 2015). In soil with neutral or slightly acid pH (6.0–7.0), favourable microorganisms and minerals necessary for plant roots are present (Yeomans 1954). Such beneficial bacteria are not present in more acidic soils, leading to uncontrolled mould fungi growth. Moreover, most of minerals are insoluble in soils possessing low pH. Sandy soil is airy and highly permeable. It has rather low water storage capacity, is fast drying and easily loses nutrients due to leaching. In practical applications, it can be improved by adding organic matter or fertilizers. Soil present in coniferous forests contain litter compost composed primarily of pine or spruce needles, ericaceous understorey plant species and mosses (Hilli et al. 2010). The compost is highly acidic but has good leavening properties and can be used as an optimal peat substitute providing favourable conditions for plant growth (Drozd et al. 2002). Recycled paper containers have been proven to have the comparable wet and dry vertical and lateral strength, similar to those of plastic containers, and showed no algal or fungal growth on the container wall (Nambuthiri et al. 2015). However, additives and fillers might influence the performance of packaging products. The goal of this work is to increase the positive footprint of packaging products by designing “eco-effective” solutions according to the Cradle to Cradle design framework. Reutilization of two kinds of materials (waste paper and cereal bran) is proposed here in order to close the loop at the end of product life cycle. The aim was to design, manufacture and examine the degradation intensity of waste papers containing cereal bran with a special focus on the effect of the soil type. Both, paper sheets and paper pots were evaluated. It is expected that by understanding the degradation rate of the investigated products it will be possible to optimize paper pots manufacturing to assure sufficient mechanical resistance and the desired rate of degradation. Two forms of paper products were examined in this study including flat sheets of paper and paper pots. Five configurations were made for both products (Table 1). In case of paper sheets, 24 samples with dimension of 15 × 95 mm, were cut from each configuration of paper. Fifty pots were manufactured from individual paper type. Paper sheets were produced in the laboratory at University of Life Sciences in Poznan on the Rapid-Köthen apparatus from recycled pulp type D (cardboard, paper, grey bags, corrugated board), weighing 100 ± 5 g m−2. The pulp was milled on the laboratory mill PFI (till 28 ± 2°SR value). The wetness was measured with a Schopper-Riegler device. The pulp was defibred using a defibrator and formed into sheets of paper with a Rapid-Köthen device. Manufactured papers were made of pulp without and with 3% or 5% addition of wheat and rye bran. Both additives were by-product of the flour production and were provided by Gdańskie Młyny i Spichlerze Dr Cordesmeyer Sp. z o.o. The fraction size of bran particles was below 0.4 mm. Details for the sample composition and labelling of investigated papers are summarized in Table 1. Paper pots were manufactured in the laboratory from the same pulp as reference flat paper sheets and with identical additives configuration (Table 1). The custom machine for forming pots was developed at University of Life Sciences in Poznan (grant number N30900831). The pot was formed directly in the container from water pulp solution with 2.5% dry mass concentration. 600 cm3 of the pulp solution was used for manufacturing of each pot. The perforated mold was used to deposit a layer of fibres with additives, where water was removed from the cast by a vacuum pump. The formed pots were dried for 12 h at 50 °C in a climatic chamber. The final size of the manufactured pot was 6.0 × 6.0 × 5.5 cm (width × length × height, respectively). Degradation and characterization were performed on commercially available products (pots manufactured with the addition of peat) in order to compare their overall performance with laboratory produced pots. Figure 1 presents images of pots manufactured in the laboratory and alternative commercially available products. The substrate used in this experiment was a natural soil sample collected close to Poznan (Poland). The soil was sieved to less than 2-mm particle size before degradation tests, and obvious plant material, stones, or other inert materials were removed. The degradation process was conducted in conditioned laboratory in 20 °C and 65% RH. Three different types of soil (sandy, forest and agricultural) were selected as degradation environments for the investigated paper products. The pH of sandy soil was ~ 7.5 to 8.0. Coniferous forest soil is usually enriched with cones and needles, but is rather poor in nutrients. It was the most acid soil studied and had pH of ~ 3.5 to 4.0. Agricultural soil, which consisted of highly decomposed matter deeply mixed with mineral soil had pH of ~ 5.0 and carbon to nitrogen ratio of ~ 10. The laboratory experiment was conducted in plastic boxes containing soils. Experimental samples (paper sheets) were fully covered by the soil. Paper pots were placed in the containers to the depth corresponding to ~ ¾ of the pot height. All the samples were exposed to the soil for 2 months and the degradation progress was monitored at the 2nd, 4th and 8th week of the experiment. The moisture of the soil during the whole campaign was kept constant in the range of around 55%. The water capacity of the soil and the ambient temperature was continuously monitored during the tests in order to provide amount of water required to achieve an adequate level of humidity. Containers with samples after installation were kept in climatic chamber (20 °C, 60% RH). Once a month small amount of water was added to the constant weight of the containers. Breaking length (PN-ISO 1924-1 1998) on the Schopper apparatus. Extensibility (PN-EN ISO 1924-2 2009) on the Schopper apparatus. Tearing resistance (PN-EN ISO 1974:2012P 2012) on the Elmendorf apparatus. Burst test (PN-EN ISO 2758 2005) on the Mullen’s apparatus. Air permeability according to Gurley (PN-ISO 11004 1995) on the Gurley apparatus. Rate of absorbency according to Cobb (PN-EN 20535 1996) on the Cobb apparatus. In addition, crushing strength was tested on paper pots on the Zwick/Roell Z005 (Zwick Roell AG, Ulm, Germany) mechanical testing machine in compression mode according to TAPPI T804 standard (2006). All the samples were conditioned to 7 ± 1% moisture content before characterization. It was impossible to perform all tests on some samples following degradation due to excessive disintegration. The degree of cellulose polymerization (PD) for paper products was determined on samples before and after soil degradation. During the test, the intrinsic viscosity was determined in cupri-ethylenediamine solution (CED) according to ISO 5351-1 (1981). Hot water extractives (T207 cm-08 TAPPI 2008). 1% NaOH extractives (T212 om-07 TAPPI 2007). The solubility in 1% H2SO4 was performed following the same procedure as in 1% NaOH (T212 om-07 TAPPI 2007). All the chemical analyses were performed before and after degradation and were repeated three times and the maximum standard deviation of results was considered as the indicator of the measurement error. A factorial one-way ANOVA was conducted to compare mean values of chemical components concentration and paper properties at significance level p < 0.05. In addition, Tukey contrasts simultaneous test for general linear hypothesis with multiple comparison of means was performed post hoc to identify groups of statistically similar samples. The analysis were performed in R software (www.r-project.org) by using multcomp module. A scanning electron microscope (SEM; S-3400 N, Hitachi High-Tech, Tokyo, Japan) in high vacuum mode with a secondary electron detector was used for imaging samples. It was necessary to coat samples with a thin layer of gold in order to obtain quality SEM images. NIR measurements were made using a Vector 22-N spectrophotometer (Bruker Optics GmbH, Ettlingen, Germany). The measured spectral range was between 4000 and 12,000 cm−1 (2500 nm and 833 nm) with a resolution of 8 cm−1. The spectral wavenumber interval was 3.85 cm−1 with zero-filling = 2. An average of 32 consecutive measurements (internal scans) was acquired for each spectrum. The degradation stage of all papers was determined on three representative paper strips and measured on three spots, before and after 4 and 8 weeks of degradation in each soil. The resulting spectra (9 spectra) were averaged and stored in a data base for further analysis. All measurements were performed in an air-conditioned room (20 °C and 65% RH) in order to minimize the effects of the temperature and moisture variations. The interpretation of spectra based on Schwanninger et al. (2011) and corresponding band assignments are summarized in Table 2. A narrow range, between 4000 and 6000 cm−1, was selected for spectra interpretation. Computation of the second derivative [21-point smoothing, Savitzki and Golay algorithm (1964)] was applied for spectra pre-processing. Spectra were also pre-processed with extended multiplicative scatter correction (EMSC) algorithm for investigation of the degradation rate. Principal component analysis (PCA) was used for data analysis. The commercially available OPUS 7.0 (Bruker Optics GmBH) and Unscrambler® X (CAMO Software AS) software packages were used for spectra post-processing and data evaluation. C–H def. + C–H str. C–H2 def. + C–H2 str. C–H def. + O–H str. O–H def. + O–H str. The overview of material flow representing manufacturing of design-for-purpose packaging products is presented in Fig. 2. The transition from open loop to closed loop systems is important in order to assure sustainable use of resources and the economic viability of modern bio-based industries. Production of packaging containers proposed here allows valorisation and utilization of waste generated during diverse industrial processes. This approach is in line with the industrial symbiosis concept, where studies regarding flow of materials between industries leads to creation of opportunities to use “waste” from one industry as a raw material for another (Cheshire 2016). In this case fit-for-purpose paper packaging containers are manufactured by combining resources generated by pulp and paper with milling industries. Increasing the recycling and reuse rates of virgin wood fibres leads to increased availability of this resource for other use. However, any recycling round requires a certain amount of virgin paper input, usually from 20% to 95% (Villanueva and Wenzel 2007). Incorporation of cereal bran into packaging products allows minimizing virgin wood fibre inputs while maintaining (or improving) the required properties. The set of expected product characteristics can be optimized by adjusting proportion of recycled fibres, virgin fibres and bran (Fig. 2). Moreover, it solves a costly disposal problem from industrial mills by providing a solution for cereal processing by-products use. Finally, control of the biodegradability rate of manufactured products allows predicting their use phase performance and duration of deterioration. The effect of additives on the chemical composition of manufactured paper products is summarized in Table 3. The effect was minor, but for all analysed components the differences between means were statistically significant (ANOVA, p < 0.05). The most noticeable differences are in cellulose content (88.6–91.2%). Cellulose content in control samples was highest and with increased amount of bran (both types) diminished. It was a direct effect of dilution, as the amount of cellulose is low in bran when compare to the pulp and paper. The cellulose content in bran as reported in literature ranges between 5 and 13% (Kamal-Eldin et al. 2009; Chalamacharla et al. 2018). In fact, such a high variation in composition within both wheat and rye brans is influenced by the cereal species, provenance, batch and milling techniques applied for flour production. The chemical composition of brans used in this study was researched by Modzelewska and Adamska (2006) and is summarized in Table 4. The differences in extractives content augmented with the bran share increase. It is an additional dilution effect of mixing components present in waste paper and bran. The bran itself contains several solvable substances that are contributing to the overall content of extractives. These, beside of cellulose include ash, dietary fibre, proteins, starch and diverse phytochemicals, among the others (Onipe et al. 2015). The relatively high amount of starch in cereal bran (estimated to be 15.8–18.9% of the dry mass) simplifies the coupling of cellulose fibres and paper forming as well as aids in filling micro-pores. However, as previously reported by the authors, the presence of starch in paper products may advance the degradation rate as it is a favourable breeding ground for bacteria and microfungi (Sandak et al. 2011). NIR analysis of investigated papers with addition of the rye and wheat brans did not reveal any noteworthy differences between spectra due to presence of bran fillers (Sandak et al. 2011). Only slight variations were noticed for CH, CH2 and OH functional groups assigned to cellulose and holocellulose. The influence of bran additives on selected paper properties is summarized in Table 5. The breaking length of papers with bran additives is about 25% higher than control samples. It can be explained by a positive effect of the filler increasing the number of connections between paper fibres and therefore the degree of bonding (Retulainen and Ebeling 1993). In this case the bran particles take part in the hydrogen bonds promoting consolidation of the paper structure. It was also noticed that the effect of mixing fibres with bran additions was not following the linear rule of mixture (Karlsson 2007). The breaking length increase was not significantly higher in 5% bran content compare to 3%. The breaking length was highest for paper products with rye bran. The addition of bran seems to have rather casual influence on the paper extensibility, even if increased share of bran slightly augmented extensibility value. Conversely, tearing resistance diminished with increase of the bran content. It was expected as tearing is usually inversely correlated with the tensile strength and breaking length (Caufield and Gunderson 1988). The reduction of tearing can be explained by the fact that addition of bran particles affects fibre–fibre bonding promoting pulling up of fibres out the network (Yu 2001). The burst resistance index, frequently used to determine the quality of paper, does not depend on the kind, but rather on the amount of filler introduced. It is lowest for the paper without additives, and slightly increases with the added bran content. The trend corresponds to that expected as the burst resistance is as well correlated to the tensile strength (Caufield and Gunderson 1988). Air permeability and absorbance increased in papers with additives. Both properties might be desirable when increased barrier properties against water are required. In the case of waste paper, adding bran leads to early disassembly of the structure of the paper while exposed to degradation; consequently, affecting the air permeability. This peculiarity has a beneficial effect for paper pots, where high air permeability improves the natural ventilation of the root system and stimulates plant growth (Nambuthiri et al. 2015; Akelah 2013). The results of mechanical tests for the compression strength of paper pots before degradation are presented in Table 6. The lowest crushing strength was observed for commercial pots. Pots without additives (WP) possessed the highest mechanical resistance among all laboratory-manufactured products and any bran addition lowered the crushing strength. It was also found that paper pots with added peat were brittle, as did not retain any strength after first compression cycle. Conversely, pots manufactured from waste paper with added bran were elastic, maintaining integrity after several cycles. Degradation processes take place in the natural environment constantly and on a large scale (Pagga 1999). Biodegradation in soil is an important end-of-life option for bio-based materials used in agricultural applications. The rate of degradation can vary significantly, depending not only on the molecular structure of the material, but also on soil characteristics and conditions (temperature, water and oxygen availability which influence microbial activity) (Briassoulis et al. 2014). Biodegradation occurs in two steps. First, the polymers are fragmented into lower molecular mass by means of abiotic reactions (oxidation, photodegradation or hydrolysis) or biotic reactions (degradations by microorganisms). Then the polymer fragments are assimilated and mineralized by microorganisms (Vroman and Tighzert 2009). The effect of soil type on the biodegradation of investigated papers was analysed by means of NIR spectroscopy. 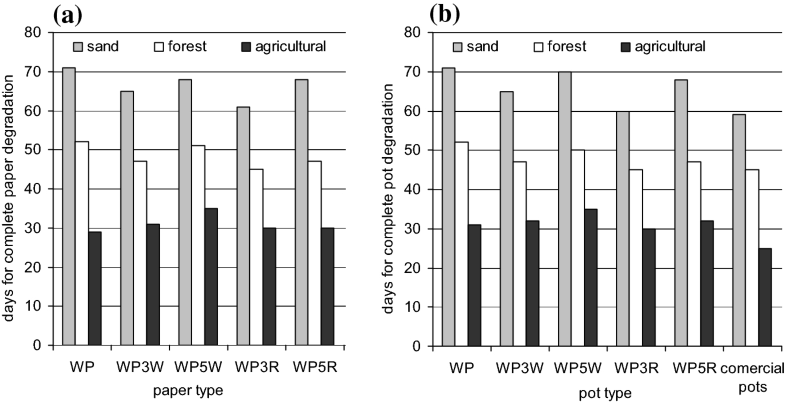 Figure 3 presents an example of degradation progress, where the evolution of the spectra acquired after degrading sample WP5W (waste paper with addition of 5% wheat bran) in various soils is presented. All peaks mentioned in Table 2, with exception of region 5464 cm−1 (7) were affected by the degradation process. However, the spectra of paper placed in a sandy soil seems to be most similar to the control samples. It demonstrates that the sandy soil containing the lowest organic content and persistent low humidity has the lowest impact on the speed of degradation, as in Mostafa et al. (2010). In contrast, the agricultural and forest soil accelerated the degradation speed. Analyses of the chemical composition of the papers after degradation in agricultural soil for 8 weeks are summarized in Table 3. Cellulose changed considerably after degradation, including quality and quantity alterations, as observed also by Shogren (1999). 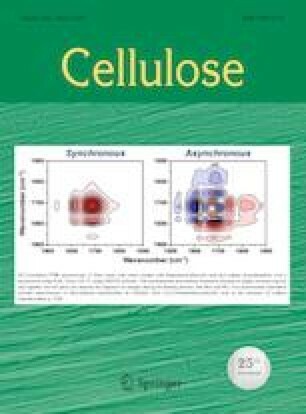 The amount of cellulose decreased in all investigated cases, where major changes (over 12%) were observed for paper with rye bran and with 5% of wheat bran. Conversely, the cellulose polymerization degree PD drop was slightly higher for papers without any bran additives. The content of extractive components was higher after biodegradation, especially in the case of extraction in 1% H2SO4. It can be explained as a result of constitutive polymers degradation due to hydrolysis and biotic factors (Witkowska et al. 1989). Microscopic analysis allows the assessment of changes in the micro structure of cellulose fibres as results of the degradation. 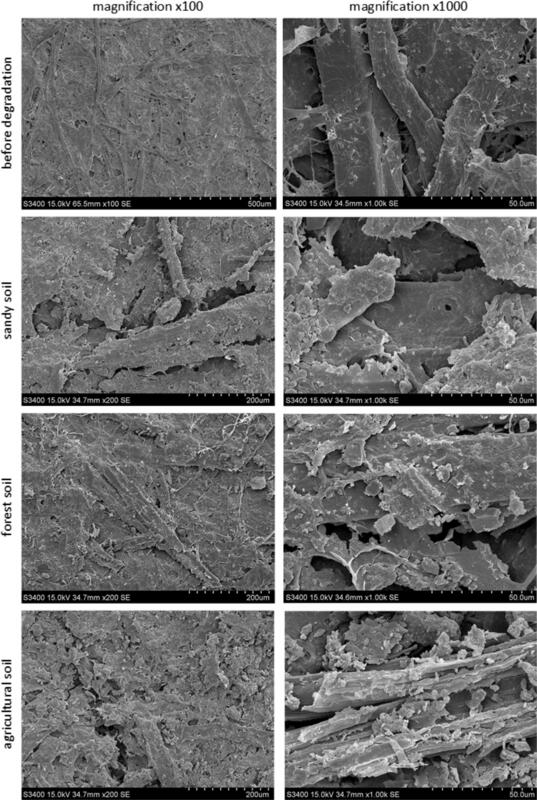 Selected SEM microscopic images of the WP3W paper samples (waste paper with addition of 3% wheat bran) before and after degradation are shown in Fig. 4. The apparent presence of both bacteria and fungi are noticed on the degraded paper surface. It was particularly evident in the outer layer, where fungal hyphae and spores are clearly visible. Swelling of the cellulose fibres caused by breaking bonds stimulated the microorganism’s growth and their further penetration toward paper bulk. It was especially noticeable in samples collected from agricultural soil, where the water reservoir was maintained at high level, and where degradation was more advanced. The mechanical properties of paper were measured on the experimental samples before and after degradation. Table 7 presents the progression of the breaking length before testing, and after 2, 4, and 8 weeks of soil exposure for all investigated papers. The results obtained from samples before exposure confirm the positive impact of fillers on the mechanical resistance of paper products and corresponds to trends reported by other researchers (Nechita et al. 2010; Gonzalo et al. 2017). None of the samples were suitable for mechanical testing after 8 weeks of exposure due to excessive degradation. The highest degradation kinetics, as related to the breaking length loss, were observed on samples degraded in the agricultural soil. Mechanical properties had dropped significantly already after two weeks of exposure. According to Sridach et al. (2007) 50–80% of tensile strength is lost during the first week of burial process depending on the type of paper product and its composition. There are several thousands of paper types produced nowadays by the pulp and paper industries. The paper products differs due to composition, formula, additives, binders, fillers, retention agents, among the others. However, the highest impact has a variation within cellulose mass used for paper making that is produced with variety of pulping, bleaching, sizing, strengthening, drying and/or coating processes. The raw resource used in this research was of recycled paper origin. The composition of fibers was therefore highly anisotropic as well as each resource batch may be different than another. In addition, printing residuals with other impurities introduce important discrepancy to the paper products derived. It affects also the degradation processes of papers when exposed to soil, making universal determination of the detailed degradation mechanism rather difficult. The effect of degradation duration on the NIR spectra of sample WP5W (waste paper with addition of 5% wheat bran) is shown in Fig. 5. Curves for most spectra bands differ from the control state (not exposed for degradation) after exposure for 4 weeks. Spectra are similar at 4 and 8 weeks exposure. 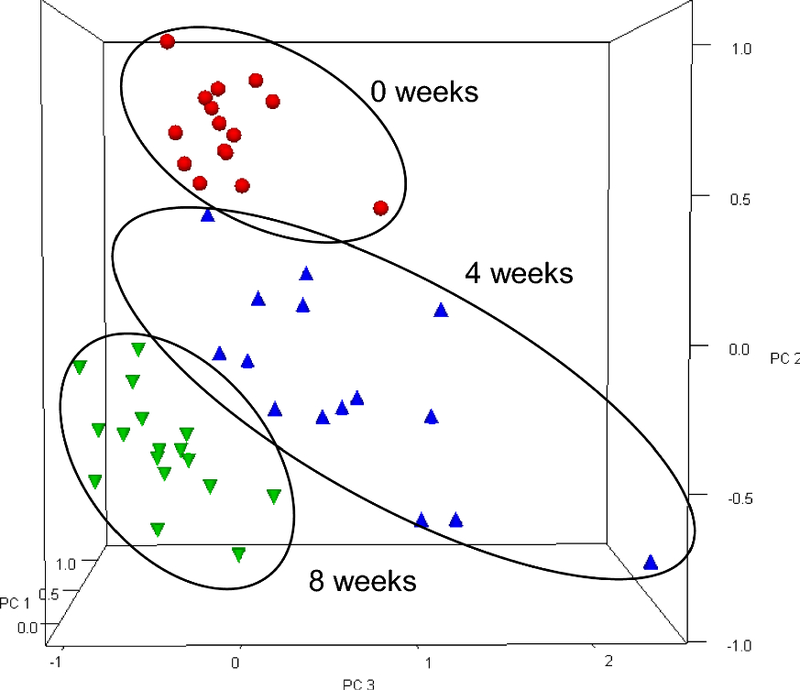 This implies that partial decomposition of the examined paper products in forest soils had occurred by week four. The chemical decomposition of different papers can be compared with principal components analysis (PCA) derived from NIR spectra. Figure 6 presents a PCA plot for three series of spectra corresponding to samples at different degradation stages of the tested papers in forest soil. Samples before degradation are grouped together in relatively small cluster. The highest dispersion of spectra was observed at 4 weeks’ exposure, while tighter clustering was observed again after 8 weeks. The high degree of scatter observed at 4 weeks exposure, together with minor cluster overlapping signifies a high heterogeneity within all tested papers as well as varied degradation kinetics, being dependent on the paper type. The vulnerability of the paper to degradation in soil was assessed by comparing the expected time to complete paper degradation. These degradation ratings for both sheets and pots, are summarized in Fig. 7 for all examined samples. Values were determined by visual estimation according to expert persons as the number of days until a terminal state would be reached. Disintegration of the paper sheet or decomposition > 75% of the paper pot was considered as a terminal state. The lowest rate of degradation is expected when paper is exposed to sandy soil, where the degradation process is estimated to take between 60 and 70 days (depending on paper composition) (Fig. 7a). A higher degree susceptibility to degradation was observed for samples exposed to the forest soil, regardless of paper type; it was estimated that complete biodegradation occurred in 40–50 days for all paper types in forest soil. Agricultural soil was considered to be the most aggressive because complete paper destruction was expected after only 30 days (compared to approximately 60 days for sandy soil). It corresponds to the previous studies where Tumer et al. (2013) reported that changes related to the decomposition were most intense in organic soil, when compared to sandy soil The presence of fillers reduced life of the paper products, despite products with 5% bran filler being observed to be more resistant to biodegradation than those with 3% bran filler. 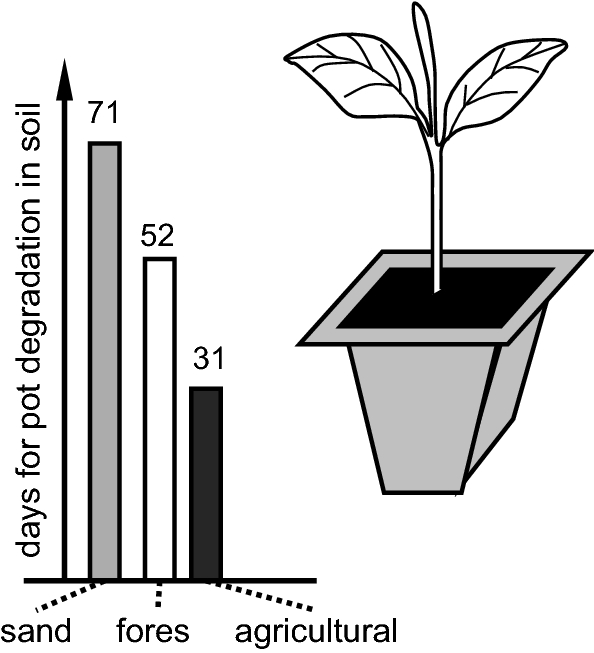 The estimated biodegradation rates of pots were similar to those of paper sheets (Fig. 7b). Commercial pots were found to decompose more rapidly than the products manufactured in the laboratory. This was due to the relatively large share of additives that increase water absorption and hasten decomposition. The laboratory-made pots with rye bran filler decomposed slightly faster than other samples. Therefore, it might be possible to adjust the degradation rate of waste paper by adding specific fillers and to deliver products most suitable for specific applications. The cereal bran used in this experiment was characterized by a relatively high starch content. Starch promotes the binding of natural fibres during paper manufacturing and consequently improves the paper strength. Mechanical properties are particularly important in the production and utilization of paper pots manufactured from recycled fibres. The addition of cereal bran improved the mechanical properties of paper products tested in this study; paper pots with bran fillers were less susceptible to mechanical damage, when compare with commercial products. The biodegradation rate of pots changes with the quantity of added bran. Biodegradation in these pots is generally slower than in commercial pots containing peat, but faster than in pots without fillers. It was concluded that the extent of decomposition does not extensively depend on the type of filling (rye or wheat cereal bran), but rather on the quantity of filler added, exposure time and soil type. Depending on the soil type, water holding capacity and pH, soil may stimulate or inhibit the growth of microorganisms responsible for the decomposition of paper products. Paper samples (both sheets and pots) in all tested configurations degraded most rapidly in agricultural and forest soils, while biodegradation proceeded slowly in the sand soil. Analysis of NIR spectra revealed that the most advanced degradation occurred in agricultural soil. The organic content accelerated the degradation rate within all investigated papers. In contrast, sandy soil, which is low in organic matter, resulted in the lowest degradation rate and inhibited degradation processes. All tested paper configurations could be suitable for manufacturing plantable bio-containers that will slowly disintegrate during their lifespan. Their use improves both the sustainability and public perception of the investigated products. However, in addition to environmental and economic aspects, the effect of alternative containers on plant growth and quality should be considered. Therefore, our future work will be related to calculation of environmental impact of manufactured paper packaging products. Proper use of the experimental results may help in selection of products with optimal composition for specific applications, including pots used in horticulture or for forest nurseries. Moreover, by proper fillers selection, packaging products with custom degradation rate best suited to certain crop cycle durations and adopted for specific types of soils may be designed. Part of this work was conducted within the framework of the project BIO4ever (RBSI14Y7Y4) funded within the SIR (Scientific Independence of young Researchers) call by MIUR. The authors gratefully acknowledge the European Commission for funding the InnoRenew CoE project (Grant Agreement #739574) under the Horizon2020 Widespread-Teaming program and the Republic of Slovenia (Investment funding of the Republic of Slovenia and the European Union of the European Regional Development Fund).